“jump-jive-and wail”, to great music made popular by Louis Prima, Cab Callaway, and Louis Jourdan by hiring “Bombay Jim & The Swingin Sapphires! 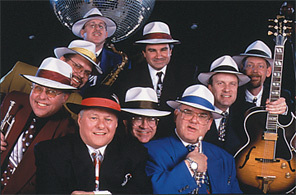 swing revival of the late 1990s. What a fun show---book this great group, now!